BARATARIA, La. — Mercury Marine president Mark Schwabero and David Foulkes, the engine maker&apos;s vice president of product development, engineering and racing, gave a combined 40-minute presentation Tuesday night, looking at the company&apos;s financial health, its new products and technology and its projected growth. 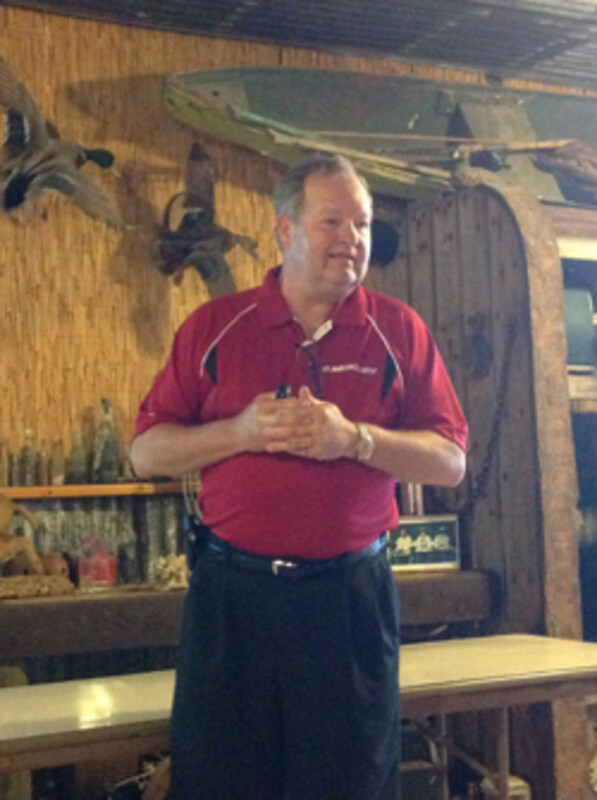 "We&apos;re feeling pretty good about where we are right now ... and we&apos;ve weathered the bulk of the storm," Schwabero told a roomful of journalists, Mercury marketing and technical personnel and boat company representatives after a day of engine and boat testing at the lodge of Bourgeois Fishing Charters in Barataria, La. About 20 media representatives were invited to check out the latest Mercury products during the three-day event. The Mercury engines, which ranged from 60 to 370 hp, were installed on a dozen boats from 16 to 39 feet. The most powerful motor was the new 370-hp TDI diesel sterndrive, installed on a Statement Marine 380 SUV. The smallest was the 60-hp Big Foot 4-stroke on a 17-foot Spyder bayboat. The largest boat was the SeaVee 390, a center console with four 300-hp Verado engines controlled by the Mercury Joystick Piloting for Outboards technology and systems. This setup was the first quad application of a joystick helm control system, according to Mercury. Click play for scenes from the Mercury event. Schwabero stressed the importance to the company of the 150 FourStroke during the economic downturn. He said Mercury made substantial investments during the recession to deliver the 150 FourStroke to the market. "We really hit a home run with the 150," he said. "It has gone beyond the volume expectations we thought we would see. The marketing message of it being the smallest, lightest and easiest to maintain has really struck home." The diesel product — the TDI diesels manufactured by Volkswagen — "really live up to our reputation from a performance standpoint," Schwabero added. The company is in a growth mode, the two Mercury executives said. For instance, since 2009 Mercury has increased its work force from 1,500 to 2,900 in its Wisconsin operations, Schwabero said. Foulkes said the company&apos;s growth also can be seen in the increase in its engineering team. "We hired 70 engineers last year," he said, "and we hired another 30 this year. We are getting the best engineers around the world." Mercury warranty rates are at record-low levels, Foulkes said. "We don&apos;t measure ourselves just within the marine industry, but against everybody," he said. "We are better than the vast majority of auto companies. Our warranty levels are comparable with Apple and with Honda." During his presentation Foulkes showed a slide of the Mercury Vessel View&apos;s 4-inch multifunction display screen — in Chinese — to emphasize the company&apos;s global market interests. "You can&apos;t be a global company and say one of our brand pillars is intuitive design and then expect everyone in the world to look at it in English," he said. The information can be seen in 15 languages, Foulkes said. Mercury&apos;s joystick technology for its sterndrives and outboards should play a large part in its growth during the next few years, Foulkes said. The inclusion of its Sky Hook station-holding capability in Joystick Piloting for Outboards should be a big selling point in the fishboat market. "Just because you have a joystick doesn&apos;t mean you have joystick control," Foulkes said. "To have control, you need authority and precision. You need your advanced features to be convenient and reliable and understand how they are working."